As we rush around in our daily lives, crisscrossing the basin, it is easy to overlook the beauty that is under our noses. Use your summer vacation to explore places in the Catawba basin that you’ve always wanted to visit but have never taken the time to visit. Located just below the headwaters of the Catawba River, Catawba Falls is a beautiful, multi-charactered falls with two distinct sections – the lower falls, which is actually a series of cascades, and the upper falls, which is more dramatic but difficult to access. Catawba Falls was frequently pictured on postcards and in publications at the end of the 19th century, but it received relatively little attention in recent years because until recently, there was no public access to the falls. 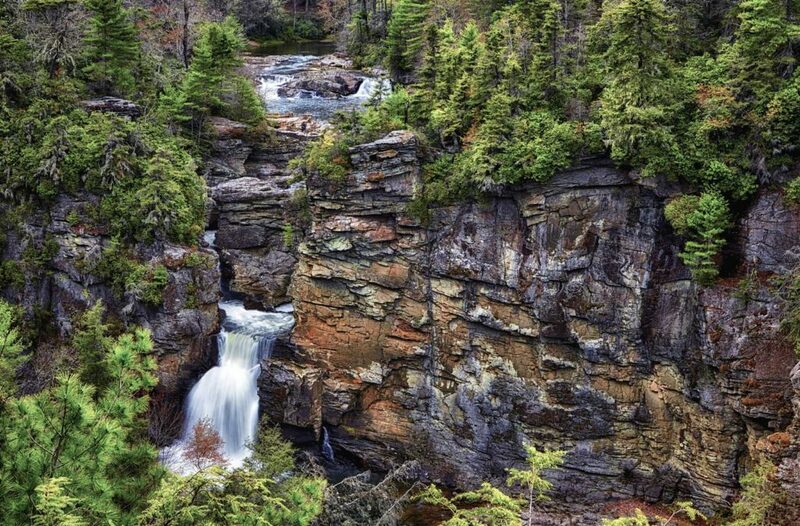 The hike to the lower falls is about 2.5 miles round-trip and moderate in difficulty. The trailhead is a couple of minutes south of I-40 near Old Fort. If you are driving between Hickory and Asheville, this makes a great stop. Additional information and directions are on the CRF website. Have you ever wondered what it was like to live in the Carolina backcountry in 18th century? Experience living history, including the African American story, at this 775-acre Revolutionary War site. See where “The Patriot” was filmed. The Bratton Plantation, owned and lived on by three generations of the Bratton family. This is a great half-day outing for the family: http://chmuseums.org/brattonsville/. The South Fork of the Catawba begins near South Mountain State Park (southwest of Hickory) and travels through Lincolnton and McAdenville before joining the Catawba River in Lake Wylie. The easiest section of the South Fork River to paddle is a section between Spencer Mountain and I-85, which is about 5.5 miles long. Most of the unique geology and biology of this segment of the river have been preserved through conservation easements. If you would rather walk, consider taking a short hike to see the waterfalls at South Mountain State Park or to overlooks where you can see the Charlotte skyline in the distance. 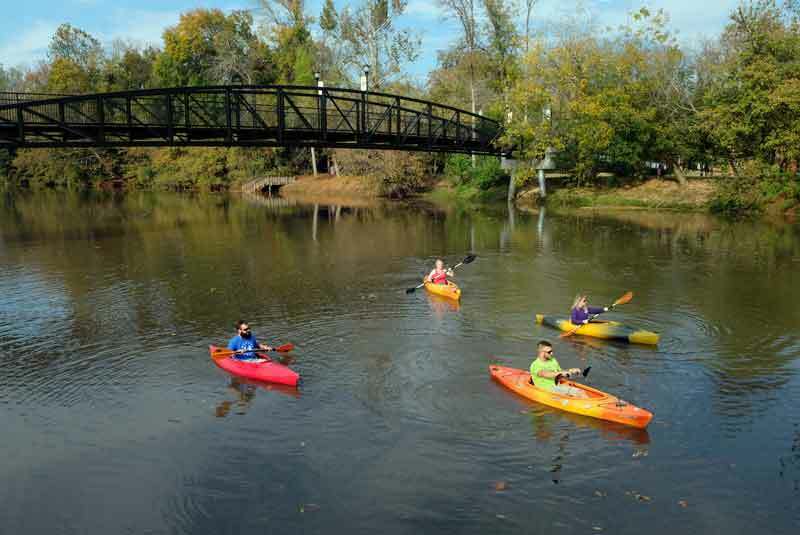 Most residents of Charlotte are unaware that there is a wonderful section of the Catawba River that is easy to paddle, beautiful, accessible, and close to Charlotte. A 30-mile section of this segment of the Catawba River between Lake Wylie and Hwy 9 (near Lancaster, SC) has been designated as a South Carolina State Scenic River. This section contains a great deal of history as well as scenery and excellent fishing. Approximately 93% of this section is free from human development. There are several public access points and parks along this section of the river. There are lots of great historic sites in the Catawba Basin, but one of the lesser known sites is Murray’s Mill – a mill complex from the end of the 19th century which includes mill, general store, and wheathouse, the John Murray House, and numerous outbuildings. Run by three generations of the Murray Family, who discontinued operations in 1967, the picturesque structures and surrounding land are the last milling complex in the region. The buildings have been meticulously preserved and interpreted by the Catawba County Historical Association since 1980 when restorations began. More information at Catawbahistory.org. Grandfather Mountain, near Linville and Blowing Rock, is probably the most visited natural attraction in the Catawba Basin. Because it is the highest peak (5,946 feet) on the eastern escarpment of the Blue Ridge Mountains, Grandfather Mountain offers spectacular 360-degree views of the region, including (on a very clear day) the Charlotte skyline on the horizon. The mountain, which is mostly in the Catawba Basin, is the home to two attractions, Grandfather Mountain State Park (which is mostly natural) and the private Grandfather Mountain attraction. Both offer spectacular views and easy trails. The Congaree National Park (which is located southeast of Columbia, SC) is one of the largest intact expanses of old growth bottomland hardwood forest in the United States. Although most of the park is in the Congaree Basin, a portion of the park is in the Catawba-Wateree Basin. November is a great time to visit the park because the bug population is less active than warmer seasons of the year. It is a great place to paddle, but hiking and camping opportunities are also available in the park. 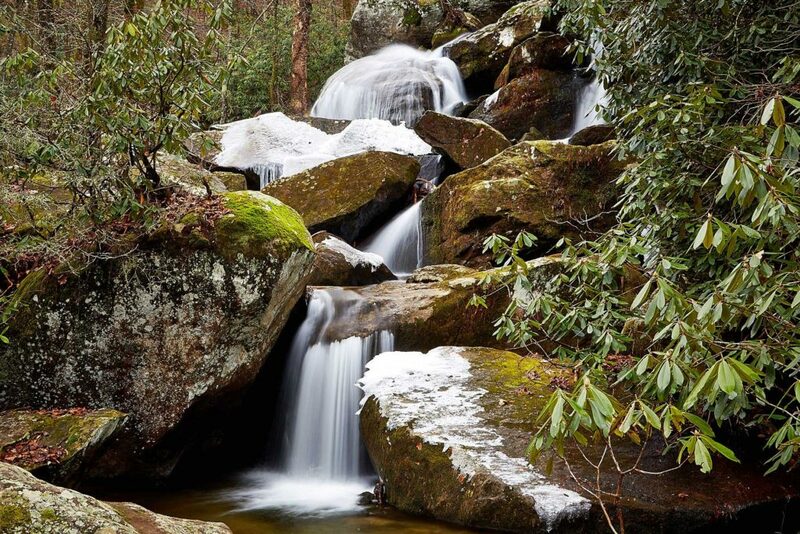 The Wilson Creek Gorge and Wilderness Area might be the best kept secret in the Catawba Basin. The gorge offers challenges for serious paddlers and hikers, but views of the gorge can be enjoyed from comfort of a car. Paddling Wilson Creek is only recommended for very experienced whitewater kayakers. However, the rest of us can enjoy watching the experienced kayakers try to navigate this challenging section of whitewater. There is a range of hiking trails in the gorge and it is possible to put together multi-day loops through the wilderness area. The Wilson Creek Gorge is located east of Linville Gorge and north of Morganton, NC. Landsford Canal State Park is in the section of the Catawba River that has been designated a South Carolina State Scenic River, but it is so amazing that it merits its own entry. Located about 45 minutes south of Charlotte, the park is the home to the largest population of the Rock Shoals Spider Lily in the world as well as the well-preserved structures associated with a canal system that made the Catawba River navigable from 1820 to 1835. The Spider Lilies generally bloom during the month of May and can be observed from viewing platforms or by paddling through the shoals. Linville Gorge offers something for almost everybody. Linville Falls, is accessible from the west side of the gorge and is a short distance from the Blue Ridge Parkway. Some of the scenic overlooks of the Falls are easily accessible from the parking lot. Others require a short hike. If you want a little bit more of a challenge in the form of a short steep hike with an unbelievable view, hike up to Table Rock from the Table Rock Parking area on the east side of the gorge. If the weather is not to windy, enjoy a picnic lunch with 360 degree views of the Blue Ridge Mountains, Linville Gorge, and Lake James. 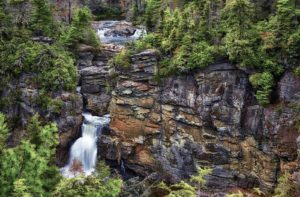 If you have a couple of days and are in good shape, take an overnight hike into the Linville Gorge Wilderness area.